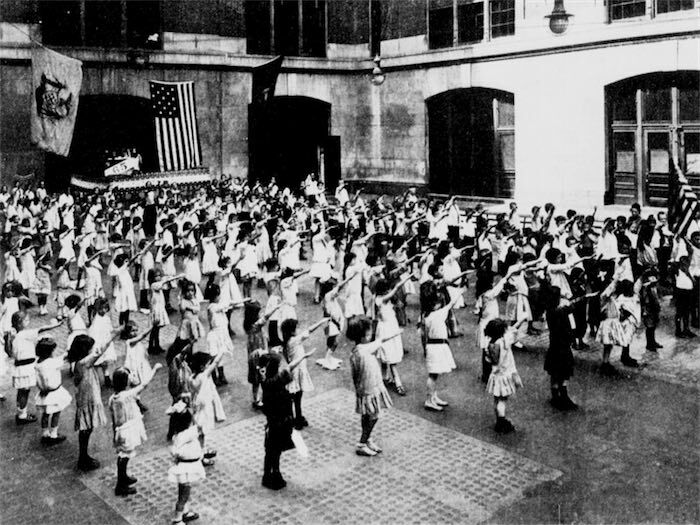 Originally known as the Bellamy Salute, the gesture came to be in the 1890s, when the Pledge of Allegiance was written by Francis J. Bellamy. The Christian socialist minister was recruited to write a patriotic pledge to the American flag as part of magazine mogul Daniel Sharp Ford’s quest to get the flag into public schools. At the time... Bellamy and his boss both agreed that the Civil War had divided American loyalties and that the flag might be able to bridge those gaps. His campaign centered around the 400th anniversary of Christopher Columbus’ arrival in the new world. He published his new Pledge as part of a unified Columbus Day ceremony program in September 1892 in the pages of the Youth’s Companion, a popular children’s magazine with a circulation of 500,000. Then in the 1930s, Hitler reportedly saw Italian Fascists doing a similar gesture, likely based on an ancient Roman custom, and adopted it for the Nazi party.